Hire a Solo Dancer or our Group for your Next Event, Wedding, Private Party, Corporate Event, Hookah Lounge, Nightclub, Promotional Event, and more. We also have some of the worlds best musicians, beautiful custom made crystal costumes, extras such as snakes, models, and everything you need for your event. Ask Natalia what she recommends for your next event. We perform Authentic Egyptian, Turkish, Folkloric, Persian, Lebanese, and much more. Our Dancers are skilled in Zils, Veils, Fire Dancing, Isis Wings, Candelabra, Double Veil, Persian Hat Dance, Sword, and more. The Dancing Fire merges the excitement of fire with authentic belly dance. Our Fire Belly Dnacers will spice up your belly dance show with the addition of fire. Our highly trained dancers use fire fans, flaming fire swords, fire belts, fire wings, and eat fire. Watch as our belly dancers balance flaming staffs on their head or eat fire right before your eyes. Fire can be done indoors or outdoors. Ask us if your space is good for our Belly Dance Fire Show. Add real live Snakes to your event! Hire our Snake Charmers to roam around your party with our friendly creatures. We have 5 beautiful and safe Snakes to add to any belly dance show or as a separate add-on as roaming entertainment. Our Snake Dancers are sure to be a hit with guests. Lead Dancer Natalia's experience as a professional traveling belly dancer has led to her expertise as one of the nation's top dancers. Her style is primarily Egyptian/Cabaret with background in persian, turkish, lebanese, folkloric, and more. Natalia's dance troupe is known for their professionalism with exquisite beauty and grace in dance. To spice up your belly dance show, The Dancing Fire also offers Belly Dance with Fire, custom color themes for weddings & corporate events, models and male dancers, snake charmers, drummers, and other hard to find additions. The Dancing Fire's beautiful troupe of belly dancers are the top in the industry. We perform Cabaret, Classic Egyptian, Arabic, Folkloric, Middle Eastern, American, Tribal Fusion, and more. Our dancers have many years of professional experience and have traveled the world honing their craft. Our belly dancers were the first to fuse belly dance, fire dance, and glow-LED to create a mesmerizing show for your party, wedding, or event. Book a Camel for your next Moroccan Theme Party or Arabian Nights Event. We have partnered with the top live animal companies in Los Angeles to bring you safe and friendly animals for your event. The Dancing Fire creates a special performance for your Wedding or Reception. Our Wedding Packages feature an array of props, music selection, costume color selection, and full customization. Let us be the highlight of your next event and leave your guests wanting more. We are based in Los Angeles, California and available for worldwide travel to your wedding destination. 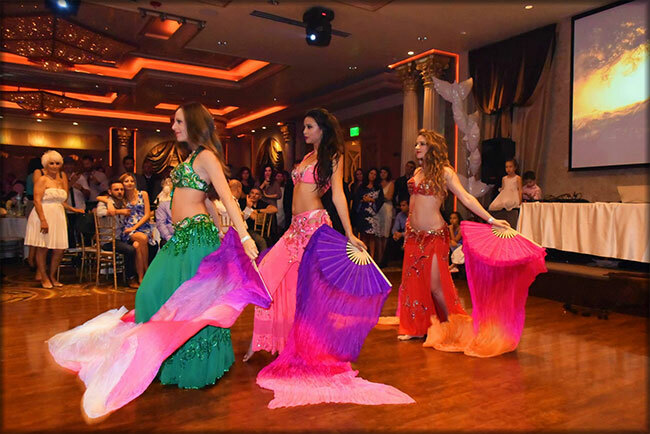 Belly Dancers are perform for at any special occasion including weddings, birthday parties, haflas, hookah lounges, bachelorette parties, conventions, Muslim weddings, and more. We also add an authentic Middle Eastern percussionist to the belly dance performance by request. All of our gorgeous Belly Dancers at The Dancing Fire are in top shape and skilled in a variety of belly-dance performance props. With over 10 years of experience, it shows in our performance. We perform at weddings, birthdays, hookah bars, restaurants, conventions, private parties, and events throughout the year. Check out our events calendar for any upcoming events in your area. 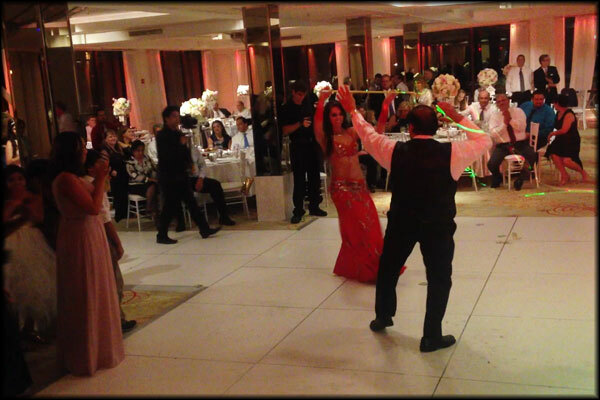 Our Belly Dancers are skilled in authentic Sword routines - request Sword for your next Belly Dance Show. Request live musicians to accompany our dancers at your event. We have teamed up with the top percussionists in the world for our belly dance shows. Live hand drums such as the middle eastern darbuka and string instruments such as the oud are a beautiful addition to any show. Let us know if you want to book musicians with the dancer. Our belly dancers offer private lessons, group parties, and more. Book a Harem Party with a group of girlfriends for your next girls night or birthday celebration. Surprise a loved one with a belly dance show at a restaurant, office, or home. Our dancer will teach a few moves after her performance. Join the fun and learn to belly dance!